Our guest this month, award-winning author Ally Sherrick, on the complexities of writing historical fiction for a young audience. I’ve been a time-traveller for as long as I can remember. If you set the dial for my own past, you’d find me weaving in and out of ancient stone circles, clambering up the towers of Norman castles and peering at rows of gimlet-eyed portraits in the great halls of countless stately homes. And if I wasn’t doing any of those things, I’d be tucked away in a corner somewhere with my nose in a book reading tales about Greek gods, Egyptian pharaohs or Tudor princesses. My passion for the past was ignited by the happy combination of my Dad’s own love of history – there was a running family joke that he was related to the Anglo-Saxon Kings of Wessex – some inspirational teachers who had the gift of bringing the past to life and my own ability to imagine myself back in whichever time took my fancy. Reading historical fiction played a big part in this. Personal favourites were Carrie’s War by Nina Bawden, The Ghost of Thomas Kempe by Penelope Lively and Joan Aiken’s ‘alternative’ historical fantasies, the so-called ‘Wolves Series’, in particular, The Wolves of Willoughby Chase and Black Hearts in Battersea. I was fortunate enough to be able to indulge this love of the past further when I went on to study for a history and English medieval studies degree at Newcastle University. Here, in the land of Bede, St. Cuthbert and the Lindisfarne Gospels, I immersed myself in the politics, religion and poetry of the Early Middle Ages for three glorious years before I was forced to return to the present once more and find a job. For the next two decades or so, my career as a professional communicator in the public sector kept me rooted firmly in the here and now. Then, in 2009, things took an interesting turn when, thanks to a redundancy, I had the opportunity to study for an MA in Writing for Children at the University of Winchester. Freed up to write for myself and with space to think, I pulled the dust-sheets from my beloved time-machine and climbed aboard it once again. After a foray into the near-future in my first (as yet unpublished) story – The Seedkeepers – a science fiction tale about a boy who lives above the last seed bank on earth, I headed back into the past to the dark and dangerous world of seventeenth century England and the Gunpowder Plot. 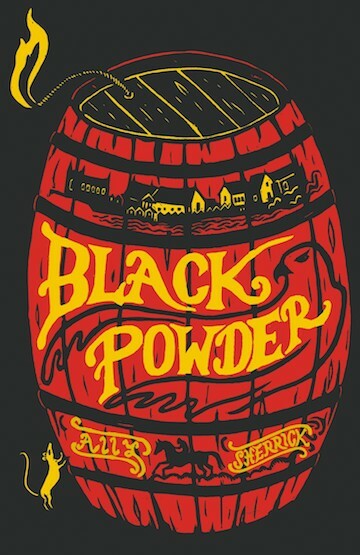 The result, after two years of writing and rewriting, a lucky competition win which brought me to the attention of my publisher, Barry Cunningham at Chicken House, and further work with the editorial team, was my debut middle grade story, Black Powder. Writing historical fiction for a young audience has particular challenges; a topic I’ve enjoyed discussing with fellow members of historical fiction writing group Histeria as part of my preparation for this article. Here are some of the lessons I’ve learned since I picked up my quill and parchment and set the dial of my time machine for London, 1605. Research is vital to make the world and the characters you are writing about real and compelling – the sort of place young readers will want to dive into and explore. But you must guard against swamping your story with unnecessary evidence of it. Adults are perhaps more tolerant of whole paragraphs describing the layout and contents of a Jacobean kitchen, but younger readers, particularly the 9-13 year olds my own story is aimed at, are impatient to be getting on with the action. They only need to know about the cauldron of stew hanging over the open fire if the hero or heroine is about to help themselves to a bowl of it! A related point is the tension between creating and maintaining a sense of authenticity about the period your story is set in and writing something that is accessible to a modern audience. Young readers will quickly drop a book if they don’t make an immediate connection with it, particularly in these days of increasing distractions and decreasing attention spans. Writers seeking to engage the imaginations of younger readers need to present a world which, while exotic-seeming and strange, is still very relatable. Compelling characters, a strong plot and then the history, in that order, are the magic ingredients. Great chunks of anachronistic-sounding dialogue are a turn-off for most adult readers of historical fiction let alone children. For a flavour of how differently people may have spoken at the time I found that focusing on creating a particular, slightly more formal rhythm of speech seemed to work well for me. I added in a few moderate expletives which the Gunpowder plotters may have used, such as ‘Zounds’ and ‘God’s teeth’ to enhance this a little further. If my characters were to seem plausible and the conflict at the heart of my story was going to pack a punch with my young readers, I knew that I had to try and create a clear sense of the political and religious complexities of the age. But I did my best to guard against including cultural references which stood no chance of resonating and risked presenting barriers to their understanding. There is also the associated issue – again applicable to all types of historical fiction – of striving to maintain a balance between telling the truth versus telling a good story. Others, including most recently, Dame Hilary Mantel in this year’s BBC Reith Lectures, have spoken more eloquently and with far greater insight than I could ever hope to do on this. But, particularly when writing for children, I do think you have a responsibility to your young audience to respect the facts of any real-life events or circumstances which form the backdrop to your story wherever you can. In my own case, where the ‘true’ story of the Gunpowder Plot overlapped with my own fictional story, I used what elements I could of it. But I was also quick to exploit the gaps in between, with an eye on what might just have been plausible, to tell the best and most exciting story I could. Meanwhile, when, for example, I made things up about real locations, like a secret tunnel for Catholic worshippers running from my hero’s uncle’s house, Cowdray, to the nearby town of Midhurst, I ‘came clean’ about this in the historical notes section at the end of the book. And I also provided a brief bibliography of non-fiction books and websites relating to the period to flag where readers could go if they wanted to find out about the real historical characters and happenings around which my story is based. But one thing above all else is true: if you set out with the express purpose of trying to teach history through your story, or worse still, to have your young audience learn some pre-prescribed lessons, you can be as sure as Henry the Eighth had six wives, that they will run a mile. Continuing the theme of responsibility, writers of all types of fiction for young readers also need to be aware of the issue of age-appropriacy and to adapt the content and tone of their stories accordingly. The past can be a very nasty, messy and bloodthirsty place. My story is about life and death stakes and I have tried to be true to the atmosphere of the time. So it opens with a hanging and there are further scenes involving violence later in the book. But, even though executions and heads on spikes go down well during my author visits to schools, I have stopped short of showing death on the page. Of course there are challenges which are largely outside of the writer’s own control too. In particular, in relation to finding a route to publication in an increasingly crowded and challenging marketplace. This is echoed by other members of the group too. 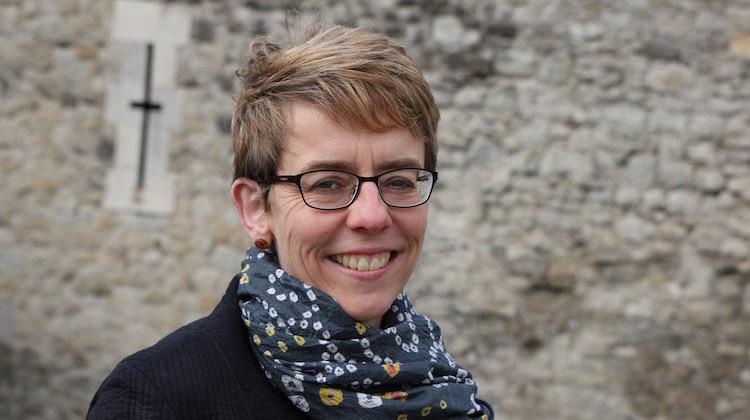 Another real issue which authors of historical fiction for young people find themselves facing is the school curriculum and the way in which it influences publishing decisions. This then is some of what I’ve learnt since I set out on my own personal journey to write historical fiction for young people. But though the challenges are not to be underestimated, the rewards, especially if you are fortunate enough to become a published author, are many. 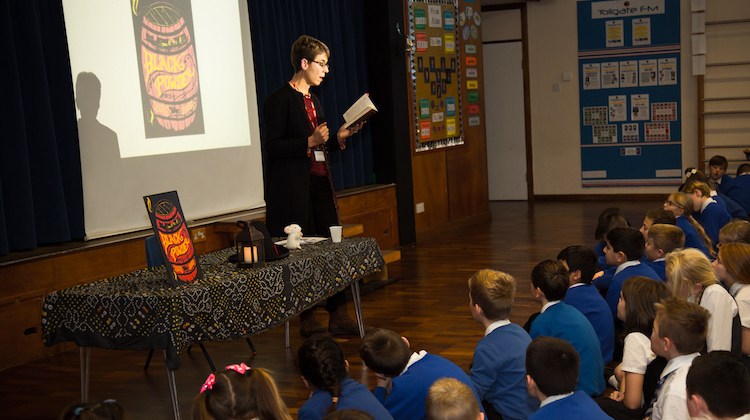 Particular highlights for me, besides seeing my first book in print, have been visiting schools and helping to enthuse young audiences both about reading and, hopefully, about history too. But best of all is hearing from them about the trips they’ve taken, or would like to take, on their own time-machines back into the strange, yet familiar world of the imagined past. 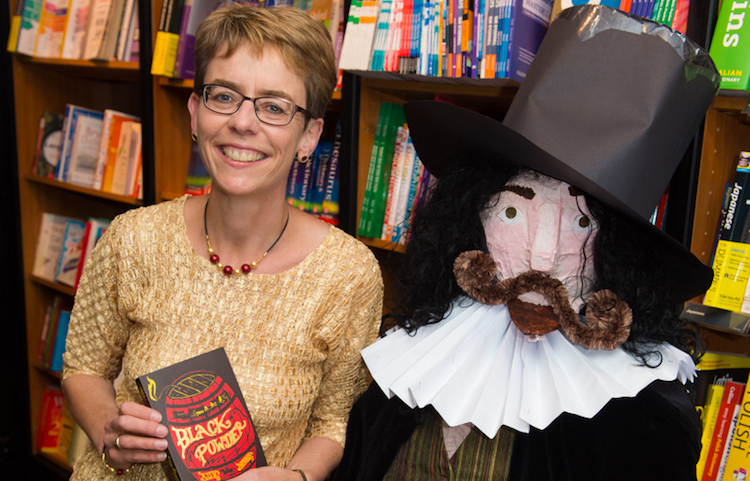 Ally Sherrick is the author of Black Powder, Winner of the Historical Association’s Young Quills Award 2017 (Primary Category) and shortlisted for, among others, the East Sussex Children’s Book Award 2017, the Dudley Teenage Book Awards 2017 and the Sefton Super Reads Awards 2017. She is a member of the Society of Authors’ Children’s Writers and Illustrators Group (CWIG), the Society of Children’s Book Writers and Illustrators (SCBWI) and Histeria – a group of children’s and YA historical fiction writers. She is currently working on her second historical title, The Buried Crown, due out from Chicken House Books in Spring 2018. With thanks to fellow Histeria members, Patricia Elliott, Griselda Gifford, Mary Green, Sue Reid, Lydia Syson and Ann Turnbull for their invaluable thoughts and contributions. Win a copy of Black Powder, plus seven other books for children and young adults in our July giveaway. Enter by 31st July!